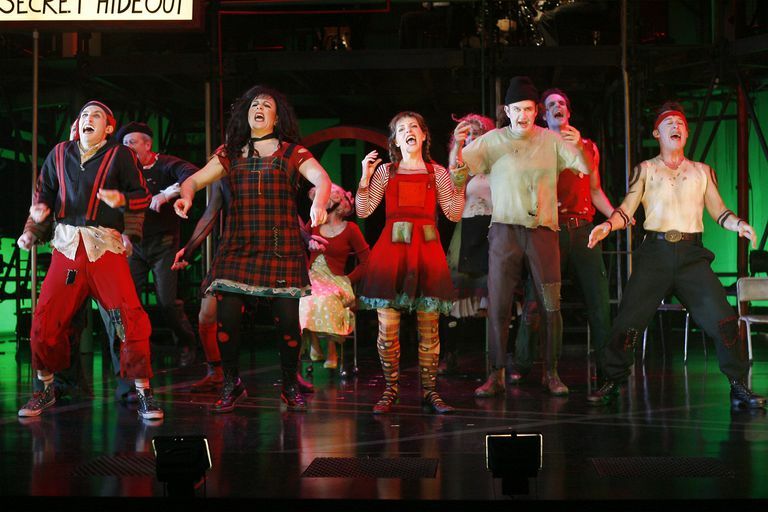 In the early 2000s, Urinetown made a big splash on Broadway. Since its surprising success, it has experienced a vibrant life through regional tours, as well as college and high school productions. We say "surprising success" because with a name like "Urinetown," you might expect the show to debut off-Broadway and stay off Broadway. Maybe even off-off-off Broadway. However, this darkly comic meta-musical which tells of a dystopian society in which everyone must pay a tax in order to use the bathroom wins the audience over by the end of the first show tune. The musical takes place in an undisclosed city. For decades, a serious drought has inflicted on society with vast poverty, although callous business tycoons such as the main antagonist Cladwell B. Cladwell, have made a fortune through bribery and the monopolization of restrooms. All toilets have become property of his corporation "Urine Good Company." A brutal police force maintains order, sending violators of the law to a place called "Urinetown." Of course, thanks to the overly ambitious narrator, the audience soon learns that Urinetown doesn't exist; anyone who is sent to Urinetown is simply thrown off of a tall building, falling to their death. Believe it or not, this is a comedy. At the heart of the story is a naïve young man, Bobby Strong, who decides to fight for freedom, inspired by the equally tender-hearted ingénue, Hope Cladwell. Their innate virtue and goodness lead them to the conclusion that changes must be made. The people have a right to use the restroom without taxation! Bobby is the first to become a revolutionary, and in the process makes some tough decisions (like kidnapping Hope, when he discovers that she is the daughter of the evil tycoon, Mr. Cladwell). More complications ensue when the revolutionaries which Bobby has mustered together decide they want to become violent, and they want to begin by killing poor Hope (as evident in the song, "Snuff that Girl"). Arguably the best part of the show is the character Officer Lockstock. In addition to being a brutal police officer (who tosses more than one character off a building), Lockstock speaks directly to the audience, explaining the way society works. Actually, to the delight of the audience, he often explains too much. He delivers a hilarious amount of exposition. For example, he can't hold back and blurts the secret about Urinetown, even though he admits that it would be poor storytelling to do so. He also lets us know that this is the type of story filled with symbolism and deep meaning. 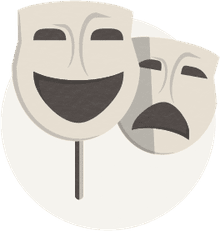 His sidekick is a Pollyanna-styled girl who, despite being impoverished and full-bladdered, remains bright and chipper throughout most of the show. Like the narrator character, she often makes comments about the story itself. She even criticizes the musical's title, and wonders why the storyline is fixated on sewer management, as opposed to other problems a society might face during a water shortage. Hope and the revolutionaries get their wish: the bathrooms of society are liberated. People are free to pee! However, once that happens, the drought gets worse and the city's water supply dwindles until everyone dies. The last line of the play is delivered by the narrator, as all of the characters fall to the ground. He shouts, "Hail Malthus!" After a little research we discovered that Thomas Robert Malthus was 19th-centuryry political-economist who believed, "That the increase of population is necessarily limited by the means of subsistence." Leave it to a musical like Urinetown to seem so silly while at the same time being dark and profound. "Matilda The Musical"- High schools worldwide will be vying for the rights. Nina Simone: The Life and Music of the "Priestess of Soul"